Underwear for men - Underwunder - Special underwear. Feel good. Feel safe. Great looking boxer shorts with a secret absorption layer that only you and we know about. Colour grey with wide white elastic waistband with blue stars. Beautiful, reliable and not conspicuous in the club locker room. Price per item. 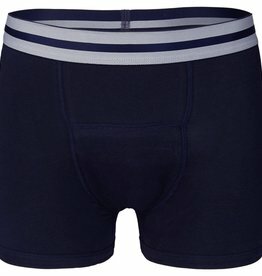 Dark blue boxer short with wide white elastic waistband with blue stars. Beautiful, reliable and not conspicuous in the club locker room. Price per item. Nice design and perfect for neutralising urine leakage. Attractive price for 2 boxer shorts. Nice package and perfect for neutralising urine leakage. Attractive price for 2 boxer shorts. Attractive price for 2 boxer shorts. Nice design and perfect for neutralising urine leakage. Both with wide white elastic waistband with blue stars. No one will be able to see that these cool boxers are much more than just great looking underwear. 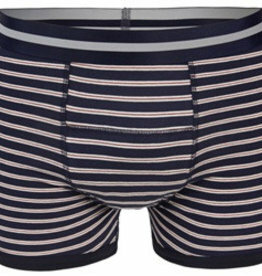 The boxers have a white elastic waistband with blue star motif. Just as cool as boxers should be. Price per set of 2 boxers.